The Electoral Reform Society (ERS) has produced a report on the general election. It’s subtitled, “Volatile Voting, random results.” First Past the Post (FPTP) claims to be designed to deliver Governmental stability, but in the last three elections, it has failed to do this twice. Furthermore it exaggerates local & regional differences, e.g. Scotland, Wales and the SE, where the leading parties margin of victory in terms of seats is higher than it’s vote warrants and the losers are under-represented. In this article, I have summarised what I see as the main themes and illustrated what ERS believe to be the impact of implementing a fairer voting system. I also make the point that different systems will cause different behaviour and I finish with a look at Germany’s PR system and a call for smaller constituencies in the belief that it will lead to a better relationship between MPs and their electors. ERS believe that the level of tactical voting or party switching was much higher than normal, caused by the maelstrom of Brexit. They suggest it as is the “Hold your nose election” because of this. They highlight the divisive nature of the result and the divided nature of the electorate, together with the number of wasted votes i.e. those votes cast that voted for losers and those votes cast for winners above the amount needed to win. They also note the establishment of vote swapping sites as people sought to make a difference. Our analysis shows that First Past the Post is failing the UK electorate – but also that there is an alternative. The rise in turnout at this election demonstrates that despite the system, people are engaged and care about the outcomes of our elections. Now we need to give people an electoral system that respects and reflects their actual choices – wherever they are. On what might have happened. What’s fun is that they calculate an alternative results by FPTP, Alternate Vote (AV), the Additional Member System (AMS) & Single Transferable Vote (STV). I have represented their results in the chart immediately below. There are some anomalies that I can’t and they don’t explain. Why is the AMS systems “NI & Other” number so high? How does STV, lead to Labour being the biggest party when it gained less votes than the Tories? These charts however, make one huge assumption, that if the count was done differently, it would make no difference to how people vote. This is unlikely to be true as they themselves argue. FPTP encourages tactical voting and there is little chance for tactical voting in most PR systems. Both UKIP and the Green Party made tactical withdrawals and didn’t run candidates in many seats, this will have the effect of reducing their total party vote and thus underestimating the seats they might have won under a fairer voting system and hence in the chart above. The ERS report examines the strengths and weaknesses of the four systems; I also attempt to explain them in more detail in my article, called Counting and also here in the first comment. On what we might do? AMS is used in Germany; it was adopted in the post war reconstruction in West Germany and thus many of the finest minds on the planet took the opportunity to write a new democratic constitution. They borrowed from Germany’s history and late unification by creating strong Länder (States) with a federal parliament, a Prime Ministerial government and an independent court, supervising a written constitution and basic law. In the UK, we have looked at changing the voting system twice in the last 20 years. In 1998 and more recently in 2011. In 1998, the New Labour Government established the Jenkins Commission which recommended an Additional Member System with the constituency representatives elected using AV, and 20% top up members based on a party list. As the Jenkins Commission report states this is the system used in Germany, although they have a top up allowance of 100%. Today, there are 630 MPs in the Bundestag, but only 299 constituencies with a population of 82 million. Given it’s my view that our constituencies are too big because the individual constituency case work is too high, rural constituencies are too large, and they generate too many local issues; MPs cannot be local advocates, government ministers and/or part of scrutiny. They become too busy. I argue for a larger House of Commons. AMS would be a good way of doing it, that or Billy Bragg’s “secondary mandate”, although the German systems asks people which Party they support, whereas the secondary mandate does not. FPTP is current system, the candidate with the most votes in a constituency can win; this may be under 50% as in most seats there are more than two candidates. In 2015, 334 seats, over ½ were elected without a majority of electors voting for them. Alternate Vote requires voters to express ordered preferences and the least successful candidates are eliminated until a winner has 50% of the vote. AMS uses a list system to ensure that total seats are proportional to the party’s votes by allocating top up seats. STV is a multi-member constituency where surpluses for popular candidates are reallocated and low polling candidates are eliminated and their votes redistributed. Actually the German system has an indeterminate number of MPs and the total number of MPs depended on how votes are cast and the constituency seats are allocated. The minimum size is 598 but today there are 630 MPs in the Bundestag; we should note that this is 20 less than in the UK and they have a population of 82 m. (The UK’s is 65). This makes the German Constituencies 2¾ times larger than those in the UK which currently average about 70k residents. The Jenkins proposals fell on the grounds that most parliamentary reform fails, it’s not in the interests of either the majority party, their MPs or sometimes all of the MPs. 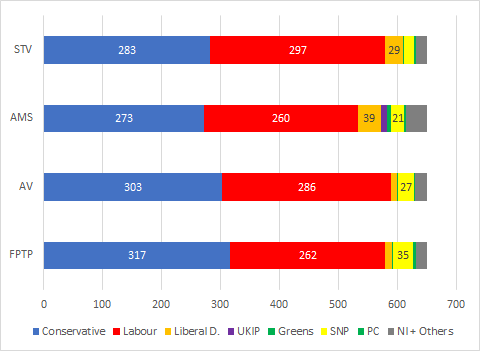 you can see from the chart in the main article, that in all three alternative systems shown, only the LibDems and the Greens would benefit where as the Tories, Labour and the SNP would lose out. In 1998, Labour had almost 400 MPs, they weren’t going to vote to abolish their mandate.